Natural products present in the plant and animal kingdom offer a huge diversity of chemical structures which are the result of biosynthetic processes that have been modulated over the millennia through genetic effects. With the rapid developments in spectroscopic techniques and accompanying advances in high-throughput screening techniques, it has become possible to isolate, and then determine the structures and biological activity of natural products rapidly, thus opening up exciting new opportunities in the field of new drug development to the pharmaceutical industry. The series also covers the synthesis or testing and recording of the medicinal properties of natural products. "There is a good mix of chemistry, structure elucidation, synthesis, and biology in the various chapters, thereby appealing to a diverse readership. The diagrams are clear and the writing excellent. 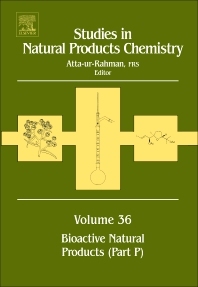 In summary, this is another excellent volume in a very valuable series on natural products for which Professor Atta-ur-Rahman is to be congratulated...... an important and essential asset for those libraries supporting the efforts of natural product research groups."